An Atlas 5 rocket blasts off carrying the classified NROL-41 satellite on Sept. 20, 2010 at 9:03 p.m. PDT (0403 Sept. 21 GMT) from Vandenberg Air Force Base in California. A new spy satellite launched into space late Monday onthe latest classified mission for the U.S. National Reconnaissance Office, butnot before a private car caused delays because it was parked in the wrong spot. The satellite's launch was delayed about a half hour dueto the pesky car, which was parked at Vandenberg's Space Launch Complex 8 ? an areathat was supposed to be clear of vehicles. The NROL-41 satellite soaredspaceward from the nearby Space Launch Complex 3E. Flight controllers wanted to be sure it wasn't a rangesafety concern, launch officials said. They later decided it was no concern for the launch. Aside from the delay, the launch went smoothly despitethick fog earlier in the day and some cloudy weather. 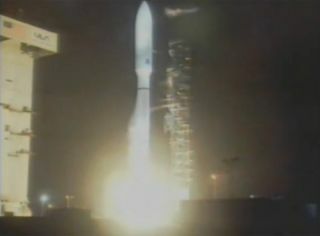 The 193-foot (59-meter)Atlas 5 rocket lit up the night over California as it headed for orbit. "ThisAtlas launch is the culmination of a tremendous amount of hard work on the partof all the men and women of the 30th Space Wing and our mission partners,"said Air Force Col. Richard Boltz, 30th Space Wing commander, in a post-launchstatement. "We're all extremely proud of everyone's efforts." The rocket carried a "nationalsecurity payload," Air Force officials said in the statement. It is the 27th satellitelaunched for the NationalReconnaissance Office since 1996, and "all mission descriptions areclassified," United Launch Alliance officials said. The satellite's launch time was also slightly adjusted early in thecountdown to avoid the chance of NROL-41 flying too close to another object inspace once it arrived in orbit. About three minutes and 45 seconds after launch, thesatellite's protective fairing separated from its rocket and the mission went into a media blackoutat the request of the National Reconnaissance Office. The gleaming white Atlas 5 rocket that launched Mondaywas the fourth to carry a National Reconnaissance Office and the 604th overall Atlas mission in U.S. history. "We've had an excellent liftoff," said DonSpencer, launch commentator for the United Launch Alliance ? a joint venture byBoeing and Lockheed Martin. "The vehicle is functioning as weexpected."